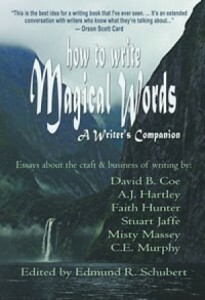 One of the original items on my to-do list that launched May 2011’s Month of Writers here on the site was a series of interviews I planned with the contributors of How To Write Magical Words: A Writer’s Companion . So this week in the Month of Writers is special — It’s Magical Words Week! Every day I’ll be hosting an interview from a contributor from the Magical Words website. 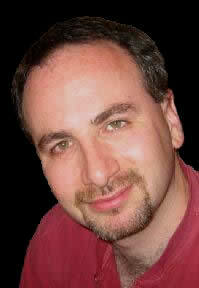 Today, my guest star is the fantastic Stuart Jaffe! Aleathea Kontis: Facebook or Twitter? SJ: I have a short story “Perchance” coming out in the July issue of Bull Spec. AK: Short Stories, or Novels, or both? SJ: I’ve published only short stories so far, but I’m actively shopping around a novel, so I’m right there in the trenches with everybody else. I feel your pain! AK: Are you a Plotter or a Pantser? SJ: Once I have a beginning, a few key points in the middle, and an end firmly in mind, I’ll start writing. The rest I work out as I go, plotting a few chapters ahead and letting the story evolve as it naturally does. I rarely finish with the ending I had in mind, but I’m somewhat close, and having AN ending in mind, gives me focus, something to shoot for. SJ: Ha Ha Ha! I use to try to get 1-2K a day but my life is too unpredictable, so I now shoot for a weekly word count of 5-7K. AK: What’s your favorite part of writing? SJ: Believe it or not, I enjoy revisions. even when it’s a pain. The story is out of my head and on paper. Now I can play with it, re-shape it, and try to find ways to make it better. AK: What’s your least favorite part? SJ: Staring at a blank page. AK: What motivates you to mentor other writers? SJ: Genre writers are so generous, and many have helped me when I was starting out. Having the opportunity to help others is a wonderful way to thank those who helped me and to keep paying it forward at the same time. AK: Is it difficult to come up with a fun and interesting essay topic every week on top of your current workload? SJ: Not really. I have the advantage ofbeing the co-host of The Eclectic Review podcast which is a weekly,half-hour podcast about science and art. We’ve been doing shows since 2006, so I’ve gotten in the habit of finding things to talk about. You really just have to look at what you’re interested in or thinking about that week and write it out. I also love writing a series of posts which gives you several weeks to explore a subject. AK: Describe how words are magical to you. SJ: Go to an old used bookstore and find something very old — a book from the 1800s or older. Open it up and you are reading words somebody wrote down centuries ago. And these words still have the power to cause you joy, pain, love, sadness. These words can still make you think and even change how you think. And these words still can simply entertain. Downright magical, if you ask me. This entry was written by admin and posted on May 10, 2011 at 8:29 am and filed under Friends, Interview, writing. Bookmark the permalink. Follow any comments here with the RSS feed for this post.